The brightest model in the Philips PicoPix range, the PPX3610 puts out up to 100 lumens on AC power, with a contrast ratio of 1000:1. It has a native resolution of 854×480 pixels and projects a screen size of 12-120in from distances of 0.5-5m. 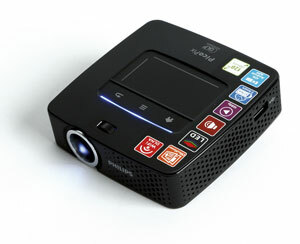 Input options include HDMI, USB and mini-USB, as well as an SD card slot and built-in Wi-Fi. The Vivitek Qumi Q5 weighs 0.490kg and has dimensions of 160×104.2×32.3mm. 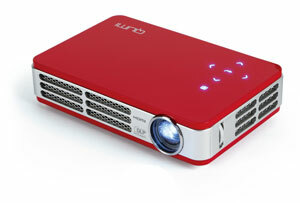 It offers 500 lumens of brightness, a high 10,000:1 contrast ratio and a native resolution of 1280×800 pixels. It also features vertical keystone correction of ± 40°. Connectivity options include HDMI, USB, A/V-in, audio jack out and universal I/O input. There is no built-in Wi-Fi, although there is the option to purchase an additional Wi-Fi dongle. 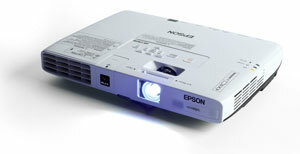 Larger mobile projectors such as the Epson EB-1761W are still slim enough to fit in a laptop bag or satchel. This model measures 292x210x44mm, weighs 1.68kg and, with its larger lamp, produces up to 2600 lumens of brightness with a contrast ratio of 2000:1. It features keystone correction of ±30° on both axes. Connections include HDMI, USB, jack audio and a component-in socket for a computer.